Robert is a kid who’s forced to attend a new school, Lovecraft Middle School, because of rezoning. Faced with being a new kid, and knowing no one but his old archenemy, he soon realizes that there’s something strange going on at this new school. Professor Gargoyle was an extremely cute and very fun middle grade read. In a way, it reminds me of a book I read and reviewed on the blog before (James Patterson’s Middle School: The Worst Years of My Life), but with an intriguing paranormal twist. That’s obviously not a spoiler, since the title and the cover definitely give away the idea that there’s something… off about this particular school. I really enjoyed the fact that such normal things as being the “new kid” or being tormented by a bully and not knowing exactly how to respond are tackled in this book. It adds that jolt of normalcy to the book that I think kids will be very responsive to. Plus, since things are wrapped up very well, I think it will definitely leave readers with a positive vibe. Of course, what’s even better, in my opinion, is the fact that magical activity is also a big part of this book. I love that the magic is sort of built into the school itself, and how it incorporates itself into the story. You can definitely see the inspiration they take from the weird works of HP Lovecraft, and I’m certain there’s only more strangeness to come. 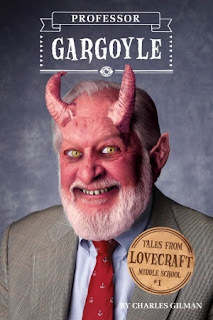 Strange, quirky, weird and cute – Professor Gargoyle was a read that I was pleasantly surprised by. I’m sure that, as the series progresses, we’re going to learn more about these characters and the school and encounter way more weird and wacky things! This sounds adorable and like the perfect Halloween read! I love paranormal middle grade books that have a touch of normalcy or something you can connect with, I feel like that makes them better. This cover does not say "middle school" to me. I know it's silly, but to me, I guess because of the suit, it looks like and adult book, probably a satire or something like that. But, maybe that's just me. Huh, I definitely wouldn't have pegged this one for a "cute" read. Now, I feel all unnecessarily judgey and curious about this book. This cover freaks me out/makes me laugh. Agreeing with others about the cover making me judge it differently!